The treat we look forward to the most in the morning is a cup of Japanese Iced Coffee. It releases all the wonderful flavors and aromatics from the coffee beans. 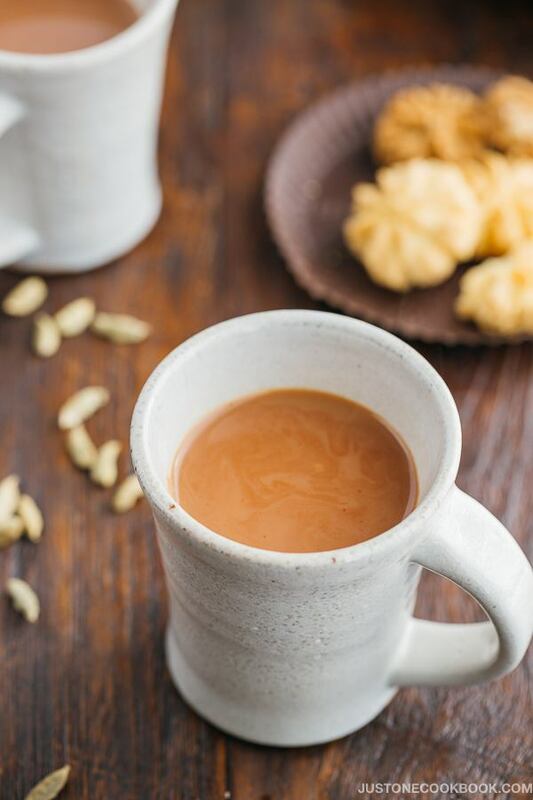 Every morning, the one thing I truly look forward to the most is the first sip of coffee. As Mr. JOC and I both enjoy coffee, we purchase and try different beans from local and independent coffee roasters, as well as coffee shops we visited when we travel. 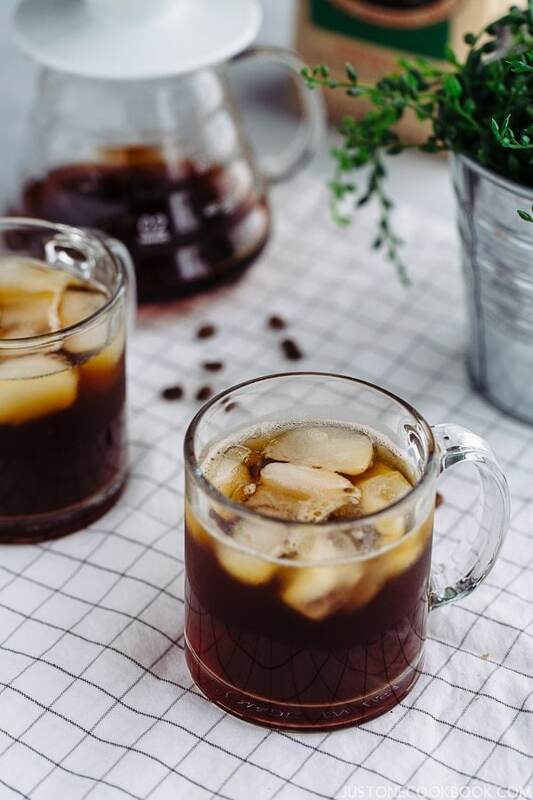 As Cold Brew coffee got more popular in the recent years, many coffee lovers seem to be more interested in how we make iced coffee in Japan, known as Japanese Iced Coffee. 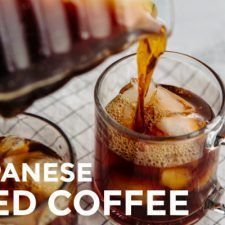 Today I’m sharing how the Japanese make iced coffee, which to us is “the best” way to enjoy coffee (until we find a better way). 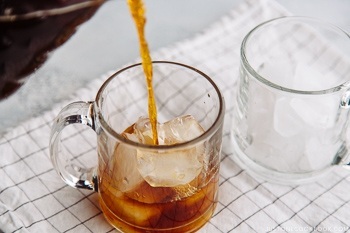 Japanese iced coffee is simply coffee brewed with hot water, directly onto ice. One-third of the liquid is in the form of ice and the other two-thirds in the form of pour-over. What makes Japanese iced coffee different from just adding ice to hot coffee? 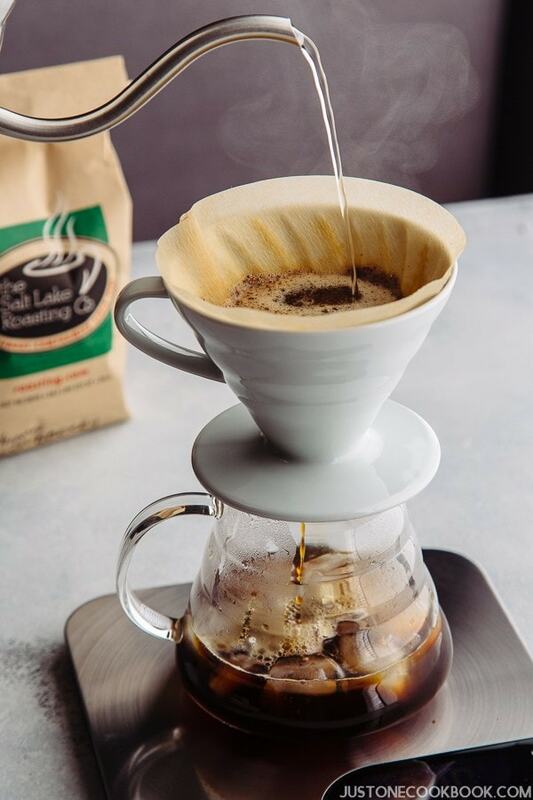 As you pour the hot water over the coffee grounds, it extracts a wide range of tasty flavors and aromatics from the ground coffee. As it drops onto the ice cubes, the ice cubes instantly lock those flavors by flash-chilling at the same time diluting the concentrate. To really test out this method, we tested both cold brew and Japanese iced coffee with multiple coffee beans. 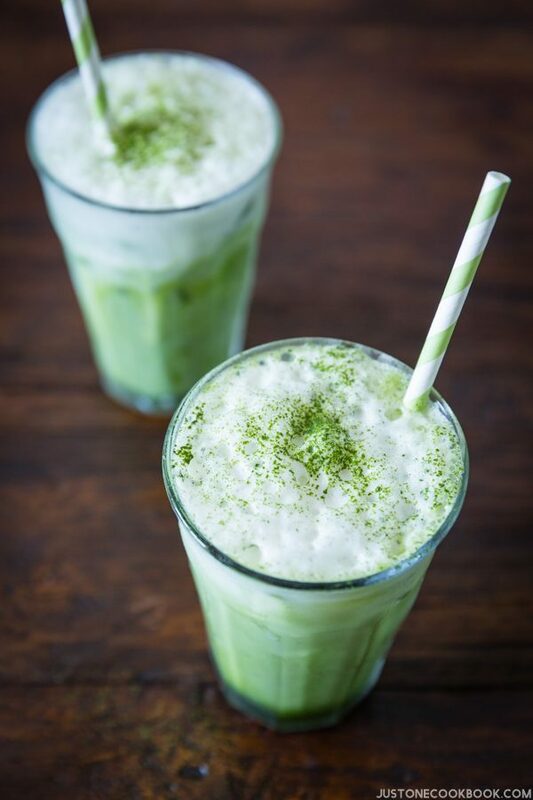 For each side-by-side comparison, the first thing we noticed was that Japanese iced coffee has much more flavors and aromatics. 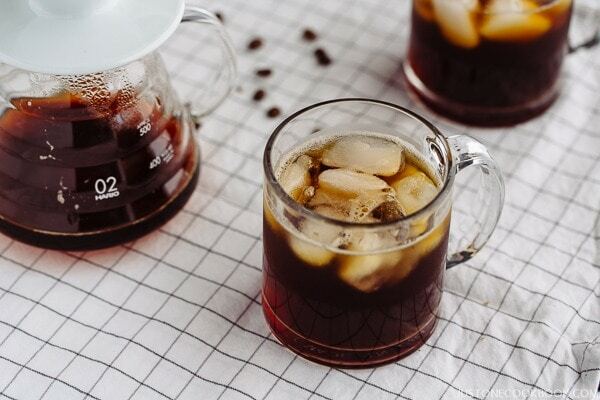 The subtle hints of caramel, chocolate, berries, and other delicious flavors hidden in the coffee beans are more pronounced with Japanese iced coffee method for the same exact beans. When done well, the Japanese iced coffee will result in a more flavorful, brighter, and complex iced coffee. You can also produce different results with the same coffee by adjusting the pour rate and grind size. It makes cold coffee faster: it takes about 10 minutes including the time to boil water. It makes just one to two servings at a time. A little more labor intensive than cold brew and more work to make a big batch the night before. 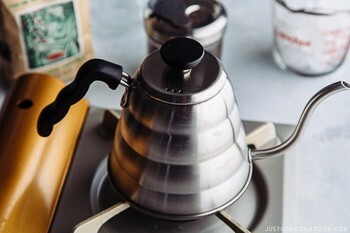 If you are already making hot coffee with a dripper, you will not need to buy special gear. In conclusion, if you are a coffee lover and especially iced coffee, please give Japanese iced coffee a try. We recommend using delicate beans that are full of flavors. If you live in the bay area try the beans from Sightglass, Ritual, Four Barrel, or Blue Bottle. Lastly, if you travel to Salt Lake City, stop by and purchase some beans from John at the Salt Lake Roasting Co. John has an amazing selection of coffee beans from all over the world and we always stop by for some coffee and pastries when we go skiing in Utah. He also ships his delicious beans so you can purchase them online. 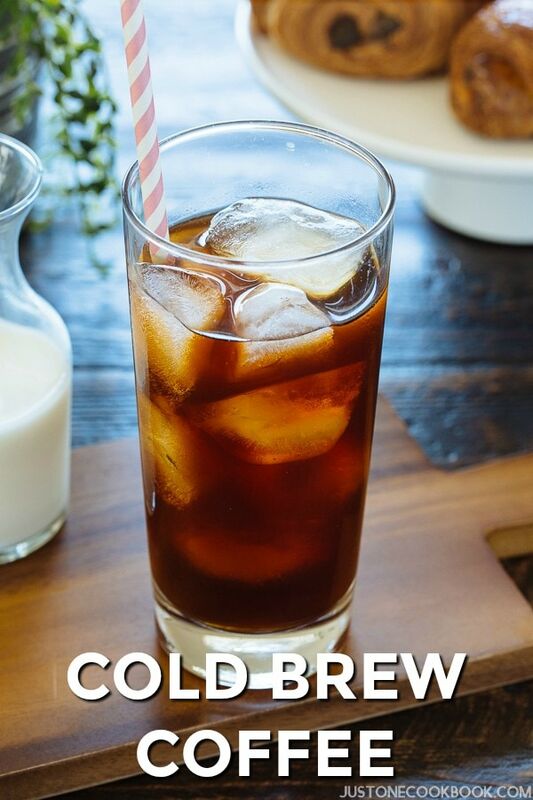 If you missed my Cold Brew recipe, please read here. Pre-wet the filter and dump out the water from the cup (read this article if you want to know why). Grind 30 grams beans (I select "drip"). Add 150-160 grams of ice to the server. 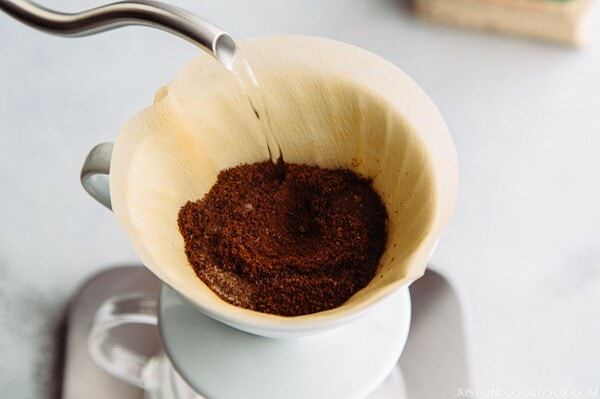 Add ground coffee into rinsed filter. Pour 20-25 grams of hot water (205F/96C - See Notes), using a circular motion around the cone and fully wetting the grounds. Allow the coffee to steep for 30 seconds. Pour remaining hot water (up to 350g) so total weight is 500g/500ml. 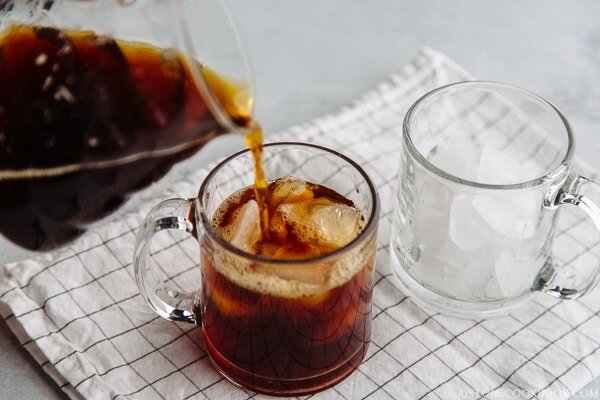 Serve the Japanese iced coffee with additional ice in a glass. Coffee beans: Any coffee works well. Our preference is a light to medium roast with bright flavors. 1 Tbsp is roughly 5 grams but each coffee grinds weigh differently but close. Hot water: It should be between 195 F (91 C) and 205 F (96 C). The closer to 205 F (96 C) the better. Boiling water (212 F / 100 C) should never be used as it will burn the coffee. Looks incredible – will definitely try this. I’ve never had Japanese iced coffee before. I would love to try this one. Thanks. I’m sure I will, but sadly, right now, I only have a French press at home. So the enjoyment would have to wait until I have all the equipments needed. 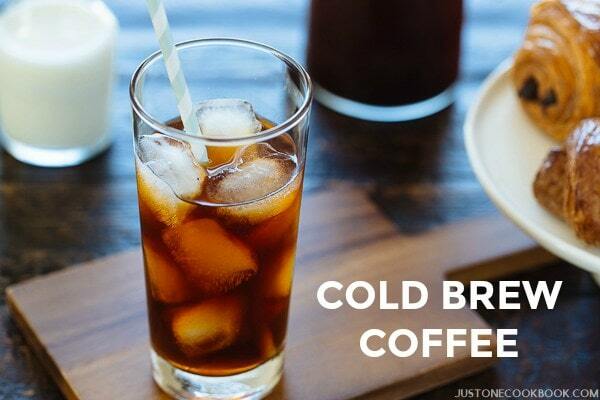 We drink lots of coffee, but never make cold brew for some reason. Summer is coming, so we should start! Terrific recipe — thanks. It would be very helpful to convert the ingredient i.e. Coffee, amounts from grams to cups for American readers. Thank you for your kind consideration. I enjoy your recipes. Hi Yvonne! If you grind coffee beans into the same size as mine, 1 Tbsp is about 5 grams. If you grind to different size, the weight might vary, like 1 Tbsp matcha powder is 6 grams, just FYI. There is no way I can measure ice cubes into cups…. But 340-350 g of hot water is 340-350 ml. 350 ml is 1 and 1/2 cup. 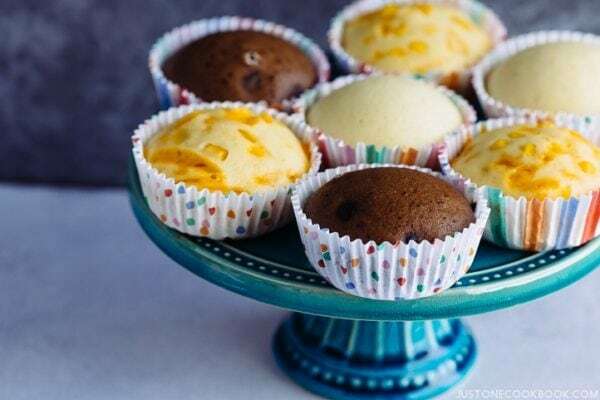 i really enjoy your recipes! 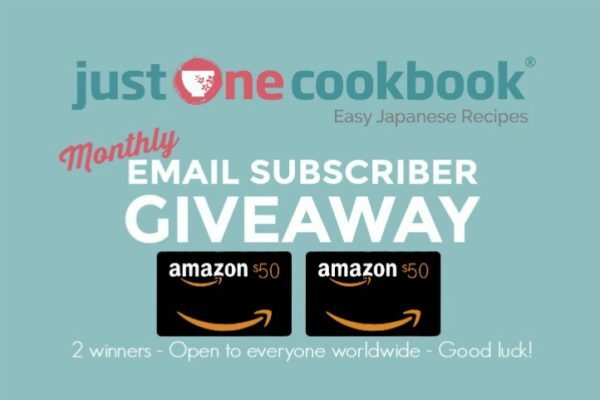 Could you please convert the measurements for your recipe for Japanese iced coffee into American measurements? Mahalo! If you grind coffee beans into the same size as mine, 1 Tbsp is about 5 grams. 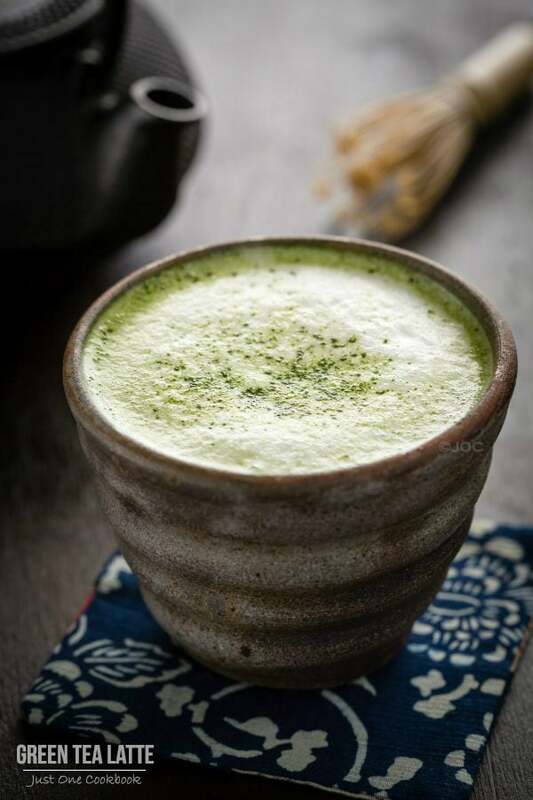 If you grind to different size, the weight might vary, like 1 Tbsp matcha powder is 6 grams, just FYI. Also, you mentioned that Japanese Iced coffee method is “without the acidity” but later in the article you mention that it is “brighter” which is confusing. That has been the opposite of my experience. 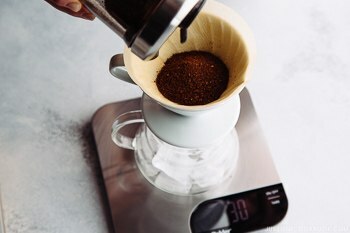 With the Japanese iced coffee method, you are using a pour over like v60 which highlights acidity. Further, you are flash cooling the coffee which locks acidity in the coffee rather than allowing it to evaporate. I believe that if you want to reduce acidity, you would be better doing a cold brew. Just my two cents. Please let me know what you think. Thanks. Hi Alex! That’s correct. 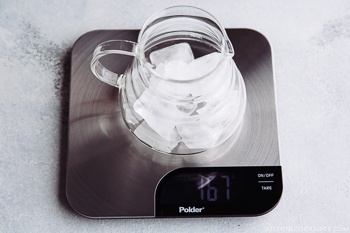 I put ice cubes in my server (150-160 g) in Step 4 and in video… The ice cubes that rea in the serving cup is to keep the iced coffee cold (the iced coffee is already cold after preparing, and there are some remaining ice cubes in there but not much). If we want to keep the ice cubes bigger, some people use bigger ice cubes. We have the bigger ice cube tray, but we thought that’s another thing for people to buy, so we use regular ice cube size for this recipe. If you use bigger ice cubes, they retain the size of ice cubes better. With the filming and shooting at the same time, we probably spend extra time keeping the iced coffee standing, so ice cubes might have melt more than how we usually enjoy though. That’s what we noticed as we can tell from the videos that from the beggning, ice cubes are more round… Studio light and everything we can’t control the heat too well. Anyway, I hope I answered to your question? I used ice cubes in the server so coffee drips over the ice cubes. Thank you for your feedback, Alex! Hi Nami, you’re right about the ice cubes! I missed that part, and apologies for that! The acidity in coffee is a big problem for me too. 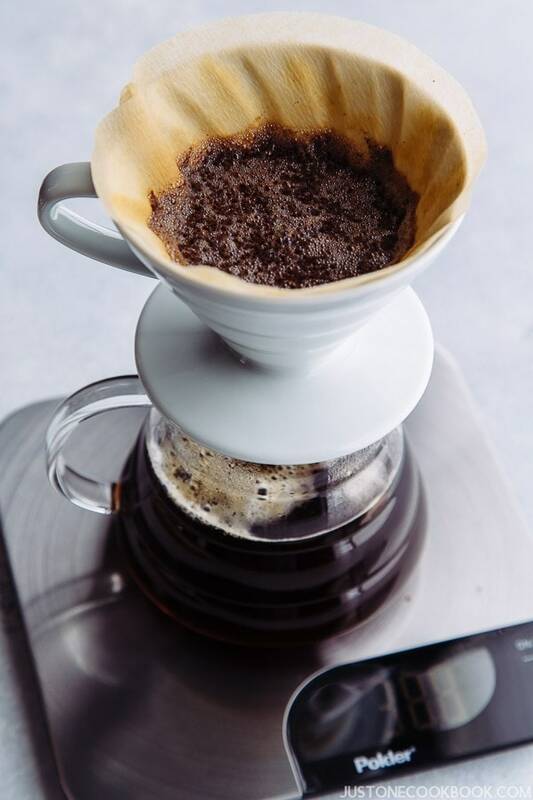 It’s just that I just can’t see the logic why Japanese Iced Coffee would have less acidity than normal pour over coffee – after all, it is extracted in the normal pour over method which tends to filter out coffee oils and highlight acidity. The only difference is that it is instant cooled, which if anything, would lock the acidity in. Could it be that Japanese Iced Coffee doesn’t have less acid but that Mr. JOC simply tolerates iced coffee better than hot coffee in general? Hi Alex, I can’t find any article that states how much acidity Japanese Iced Coffee method has, only found that cold brew has 60% less acidity than hot coffee. I might purchase a ph strip to test one day. For now, I can only rely on Mr. JOC’s stomach which is really sensitive to coffee acidity. I love iced coffee! I definitely need to try this. Thank you! I love iced coffee, this would be such a treat on a hot summer day! 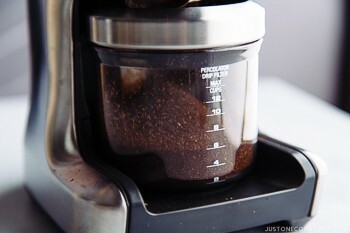 My husband loves his brewed coffee but not cleaning our coffee maker. 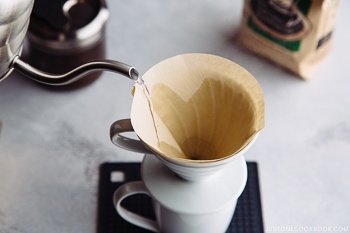 I found similar coffee drippers and filters at our local Daiso store. I confess I buy way too many cute things there! I am just wondering, if decaf coffee could be used, as I have an allergy to caffeine.